Rotala has released its half yearly financial results for the six months to May 31, 2011. Revenues rose by 18% to a total of £26.6m (2010: £22.5m). 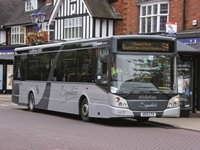 This rise in revenue occurred in both Rotala’s major business streams, Diamond Bus and Wessex Connect, and was attributed partly to the acquisition of largely commercial Preston Bus Limited (PBL) for £3.2m from Stagecoach Group earlier this year. Revenues in contracted services rose by 8% to a total of £10.3m, with commercial services revenue showing the largest period on period increase with a rise of 32% to £13.8m. Both these rises were attributed largely to PBL – although there was underlying growth in other areas – whilst its charter services showed little change. Overall profit before tax went up 15% to £0.92m (2010: £0.80m). Cost of sales was up 21% but gross profits rose by 6% compared to the same period in 2010. Administrative expenses had a low increase of 4% despite the extra depot inPreston. Profit from Operations was up 8% at £1.7m. Finance expense was little changed. Basic earnings per share also showed a substantial 13% increase to 2.75p per share. The gross assets of the group stood at £49.2m at May 31, 2011, up 13% from the previous year, after the addition of PBL, the purchasing of a new depot at Avonmouth, near Bristol, and selling of about 30 vehicles. The fleet stands at about 540. A dozen new diesel-powered vehicles are due for delivery in the latter part of 2011 – in addition to 15 Optare hybrids, the cost of which has been subsidised £1.6m by the government’s Green Bus Fund. Around 30 buses are expected to be disposed of in the coming months. The loans and borrowings of the group, including its obligations under Hire Purchase (HP) contracts, remained at just over £20m. Net assets reached £20.4m at the period end (2010: £18.3m), equivalent to 58p per share. Cash flows from operating activities increased 94% in net to £2.3m, from £1.2m in 2010. Investment in property, plant and equipment (net of settlements paid on vehicles disposed of) totalled £0.3m. The capital element of payments on HP agreements totalled £2.1m in 2011 on a larger business base (2010: £1.8m). £625,000 of the outstanding Convertible Unsecured Loan Stock was paid off early. After dividend and interest payments, the closing figure for cash and cash equivalents was £0.4m. An interim dividend of 0.40 p per share (2010: 0.30 p) on December 5, 2011 to all shareholders on the register on September 30, 2011. The terms of the offer were that the life of the loan stock would be extended to December 31, 2014, at the current coupon of 8% per annum. The conversion price (based on the price of a 25p ordinary share on April 27, 2011) would be reset at 45p per share. The Group uses 13m litres of fuel per annum but has decided to remain unhedged at the current time whilst constantly reviewing the situation. In his non-executive chairman’s Rotala revenues rise statement, John Gunn said: “The Board remains very conscious of the need, in these volatile times, to retain adequate capital and minimise risk. We focus particularly on the levels of debt in the business. In the first half of the year the ratio of total debt to earnings before interest, depreciation and amortisation (pro rata to the full year) fell significantly, when compared to 2010, from 3.3 to 2.7 times. We are determined to maintain this downward trend. “With the acquisition of Preston Bus, more than 50% of the group’s revenues derive from commercial bus services. Our largest competitors in theWest Midlands and in the South West have concentrated this year on trimming their operations and optimising their own performances. This has enabled us to take up new routes as the incumbent operators have retreated. We feel that, with a lower cost base than our larger competitors and a young bus fleet, we have a worthwhile advantage; we are keen to expand further our commercial bus services. We have also responded to increased operating costs by raising fares. We will take similar action, wherever appropriate, in the rest of the group. Stagecoach Manchester held a ‘Farewell to the B10M’ event on Saturday (November 14) – when the last two Volvo B10M buses in frontline service were formally withdrawn.